The Zebra Stainless Steel Loop Handle Pot, or Billy Can, is an absolutely fundamental piece of Bushcraft equipment. Ray Mears and the Woodlore team have been using these cooking pots for well over a decade now, and are seldom found without them. If you're going to buy just one piece of equipment for cooking in the outdoors, we believe that the Zebra Billy Can should be your first choice. Woodlore stock the Zebra Billy Can, or 'Loop Handle Pot' as it is otherwise known, in four different sizes. This, the 12 cm model, is the perfect size for solo backpackers. 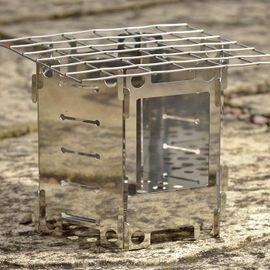 It is also ideal for use with The Honey Stove and makes a lovely compact set with the Littlbug Junior Camping Stove and Esbit Alcohol Burner. This product comes with plastic auto-lock lid clips included, but we recommend that these are removed when cooking over an open fire or on a stove. Each Zebra Billy Can comes complete with an internal dish which can be used for steaming or cooking on above the main area of the can. Once your food is cooked, the dish can also be used as a small plate. The notch in the handle allows the Billy Can to be suspended from a pot hanger. 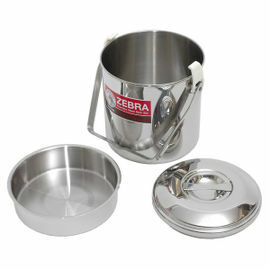 Zebra Stainless Steel Billy Can 12 cm is rated 5/5 based on 85 customer reviews. Great piece if kit. I have always wanted one and now that I've started more solo nights away I need something better for my cooking. Very strong and lighter than previously lead to believe and it has a greater capacity than previously thought, it would easily cater for a ration pack. Could cook a decent sized meal. Great service from the Woodlore team. Great bit of kit, no complaints. Does exactly what it's supposed to do. Great so far. 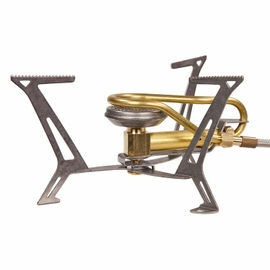 Have been using it on my twig stove and soon will be using with a spirit burner. It is everything I expected it to be. I was surprised how much smaller than my 14cm Billy can this was, but both are very well made and well worth the money. The 12 cm works perfectly with the Primus Express Spider II I purchased at the same time which fits neatly into the lower section. A great, portable Billy can. Fantastic piece of kit now packed in my go bag at all times. Do not leave home without it! Indispensable on all trips, So versatile and does so much! Brilliant, fast service! Thanks Woodlore. Did not know this came with plastic lid brackets, but fixed this by bending a wire from a coat hanger. The pot has been tested on a hob, coals, open fire and gas. The perfect kit for making breakfast in the great outdoors. Delivery was about as fast as it gets. It took 3 days before I got it. That's normally what I'd expect if I ordered something locally here in Norway. Great product, a valued addition to my kit. Very versatile piece of kit. I have used the in insert to cook a damper bread along with the 14cm zebra 'lunchbox'. Between them they make up my core cooking kit, at an inexpensive price. Great quality set at an extremely affordable price. This little can is absolutely fantastic. Solid, reliable and multi functional, I've even fried a breakfast (for 1) using the small inside plate. I'm going to invest in one of the larger cans to complement it. Do theses Billy Cans come with locking plastic clips? Yes, however we recommend removing these when cooking over an open fire.